My Son James turned 21 this week, any one that knows me, knows that James isn’t my biological Son but that doesn’t mean that I love him any less than I do my other Children, he is such a great person and I am so proud to have him as part of our family and he knows that I would do anything for him. For his Birthday dinner I just knew I had to make him something special and like me James loves desserts, he especially loves cheesecake and he also loves white chocolate, so the recipe below was just perfect for him. In the picture above you can see James with his true love, his Cosworth, this thing gives me nightmares and I worry myself sick every time I know that he is out in it, but James has Ford Respect and it will always be Ford Respect ! Put the shortbread biscuits in a plastic bag and bash with a rolling pin until they resemble breadcrumbs. Mix the biscuit crumbs together with the softened butter and press firmly onto the base and sides of a 20cm springform tin. Refrigerate until needed. Melt the white chocolate in a bowl in the microwave and set aside until needed. Beat together the cream cheese and fromage frais until smooth and thick. Add the strawberries to the cheese mixture with the melted white chocolate and mix. Spoon the cheesecake filling into the biscuit case. Level the top and chill for about 4 hours until set. I felt it needed a little longer than 4 hours to set, so you could make it the day before you need it. 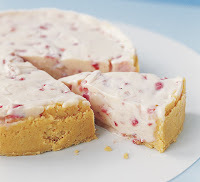 This doesn’t set like a true cheesecake, its stays very light & fresh and just perfect for a Summer treat.